Remember that little closet remixing project I kicked off at the beginning of the year? Well it was awful. I feel like whenever another blogger completes something like this, they are so enlightened and just loved it. Yeah, no. Sure, I learned some stuff and saved some money (which I promptly made up for when it was over...) but wearing the same limited number of items over and over again was SO boring, and given that I have gallons of other clothes (yes gallons...) it felt tremendously wasteful. My blog died too. Blogging what felt like the same thing over and over and over was SO dull. However, it did make me realize a few things about blogging. Historically, I've basically written a shopping blog. I buy things, and style them, and post them on the blog once or twice. Then I buy more things, and repeat the process. That's a rather expensive process, and a very easy way to accumulate so.much.stuff. When I wasn't shopping, or even wearing most of my clothes I felt zero inspiration to photograph and share my outfits. So, I probably need to work on that, because the cycle is no bueno. After the remix, when I kind of just stopped blogging, I realized that my style had been very much influenced by blogging. Taking a step back gave me an opportunity to reevaluate what I really like, and recognize that a lot of my purchases have been for blog content or just to kinda "hop on the bandwagon". Dressing for just my life vs. life photographed for the blog, made a surprising difference. For example, I gravitated towards basics and neutrals. I found myself wearing some jeans, a pair of killer sneakers, and one statement item; maybe a chunky necklace, a bold print, a graphic tee... but not five at once like blog world. I don't think I mixed patterns once in the last two months. I invested in quality over quantity, haven't bought a single handbag or clutch, and have only bought trends that I like, vs just trying every trend that exists. I realize this may sound silly, and describe how most people shop anyways, but for me it was a bit of a revelation. The kicker is, this revelation didn't come during my remix project, but afterwards when I was just not blogging. Anyways, thanks for reading, and have a great weekend! While I missed you when you were away, I'm glad that you were able to learn things from your experience. I notice in myself that I tend to look at things I wouldn't normally look at just because a blogger wore them or recommend them, but it doesn't mean I *need* to buy them. I'm trying to get better at that. I'm looking forward to your "new and improved" personal style! I've been thinking about doing a month where I don't wear anything new (or newer than a couple of months) and really force myself to mix my older pieces up...that could be fun and still interesting. What a great set of questions to ask before pulling out the debit card. Pinning to my Pinterest FASHION board! Thank you. When I read this I was saying "yes" "yes" "yes"! 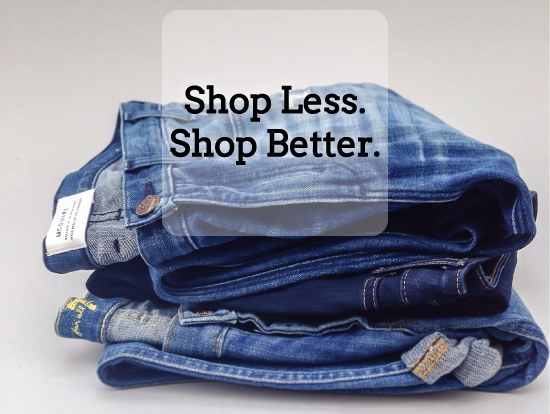 I have always been a big shopper but having the blog sure does influence a lot of what I buy. I have gotten somewhat better about my recent buying choices, but I still have a ways to go. I'm also trying to take an approach similar to this. But it is seriously hard to step back and ask myself this! Hi Jenna! This is such an honest and beautifully written post. I am currently traveling on a five month adventure around the world, and I am currently on month one of the five months. SO I can sympathize with your pain of wearing the same thing over and over. I only take solace in knowing that at least I am meeting so many new people while I am traveling that to them, I am wearing something new haha! I can definitely relate to falling into the trap of buying items for the blog vs for real life! The struggle is real! Thanks for sharing your test. So very valid and such a useful way to check myself before making an impulsive purchase. Thanks for sharing! 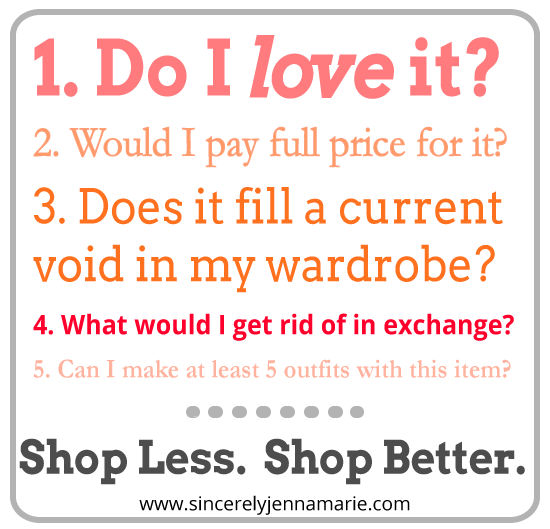 I'm going to have to start using those questions when I go shopping, I feel like it would save me money for sure!